cruising range of about 235 miles. 15" LCD tv/w DVD player. her lines run directly to the cockpit. 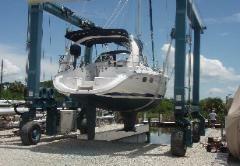 She is professionally maintained & mechanically sound, not to mention one beautiful sailboat. Call or email so we can discuss your next amazing adventure!